Project 39A (erstwhile Centre on the Death Penalty) at the National Law University Delhi will launch its annual criminal law lecture series on September 28, 2018. Justice Muralidhar will deliver the inaugural lecture on ‘Crime, Punishment and Justice in India: The Trajectories of Criminal Law’. The lecture will engage with the limits of criminal law, while reflecting on the trajectories of criminal law jurisprudence in India. The organisers hope to initiate reflections on ‘what we punish’ and ‘how we punish’ within the framework of the Constitution. Advocate Menaka Guruswamy, Supreme Court of India, will be delivering a brief introduction to the keynote lecture. 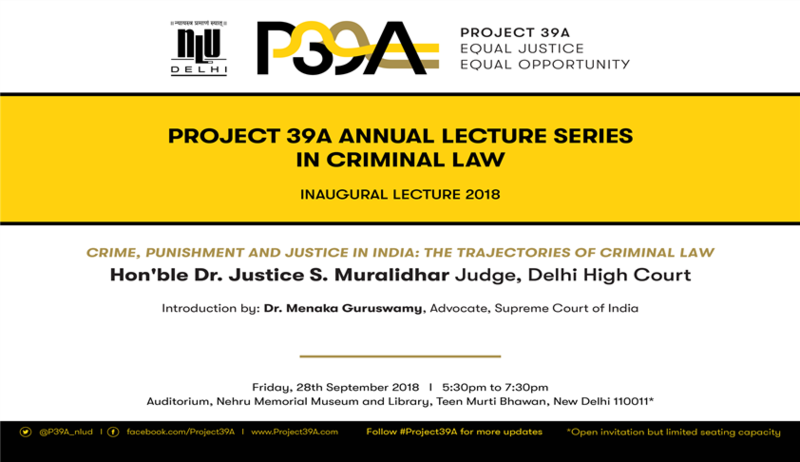 Drawing inspiration from Article 39-A in the Constitution on equal justice and equal opportunity, Project 39A signals the broadening of its engagement with the criminal justice system in India through its research and legal aid initiatives. Project 39A will explore issues of forensics, torture, forensic mental health and legal aid while continuing our engagement on the death penalty. This broader approach reflects their belief that multiple aspects of the criminal justice system need research and intervention to address the barriers that impede effective access to justice.